Whenever I hear a new secondhand bookstore is opening, I always like to be one of the first in line on opening day. That way I can scoop up all the number ones on offer, along with find any holes in my collection from their debut offerings, before anyone else beats me to it. Recently my birth town of Whakatane was home to just such an event, and here are the final four picks I grabbed. GHOST RIDER #25 Man, I really have to master that whole 'spoiler alert' thing. Be it Dan Ketch or Johnny Blaze, the Spirit of Vengeance always spins my wheels. 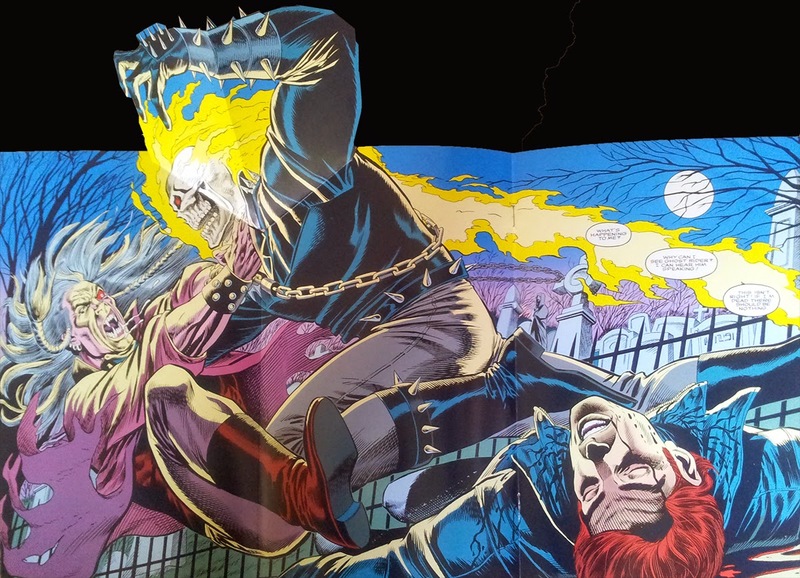 In the 90's, his books (yes back then it was plural) were home to horror and great art, and this foil covered milestone issue with the cardstock fold-out pop-up centrespread shown above is no exception (ahh the 90's)! The best damn hero Marvel has, that's who! Trade secret: I've always wanted this cover. Hey, it's Ghost Rider and Dr Strange soaring up a giant plant in the middle of the city, what's not to love? Trade truth: I read the first internal splash page, and my interest stopped there. Missing the 'Ron Marz written and Darryl Banks drawn 'Kyle Rayner' years' led me to pick this one up, as it really was a great era for the franchise and an awesome birth for a hero. 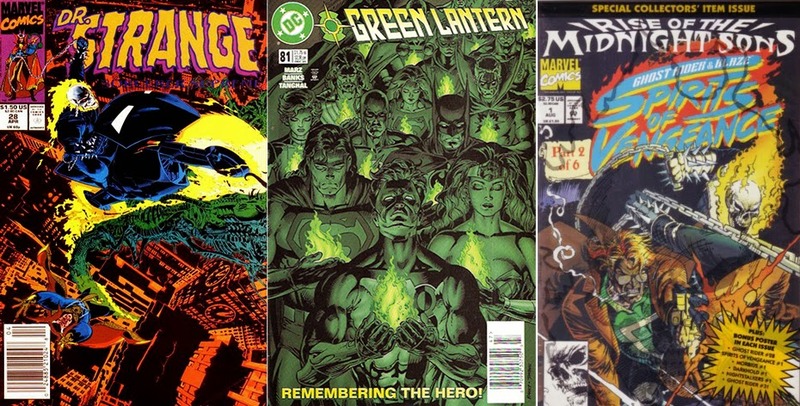 Here, Hal Jordan's funeral post Final-Night, sees even Swamp Thing and Constantine show up for a ceremony held in a power-ring created cathedral in the ruins of Hal's decimated hometown. Don't you love it when a secondhand bookstore has a comic for sale with the original polybag it came in unbroken? Or am I the first to find one?! Drawn by the always hard to beat Adam Kubert, this issue witnesses the rise of Lilth, the demon mother, who quickly calls upon her surface dealing children, to begin the first phases of her plan. Damn interesting and cool pics there Dan. I used to have Green Lantern#81 myself. Kyle, as written by Marz, was a pretty good hero on his own. Unfortunately he never escaped Hal's shadow, no matter how hard he and other writers worked to build him up as his own man. I agree though, that Dr.Strange/GR cover is too cool for school. Thanks Dale - Doc Strange has to be headed for his own series again soon right? I mean there's the movie on the way, classic 70's trippy Doc Strange surely has to be on the cards! You would think Dan, you would think. Who knows what version of the Doc we'l see, or the costume, but other way, if it matches Guardians in success, the skies the limit as far as other character adaptations go.